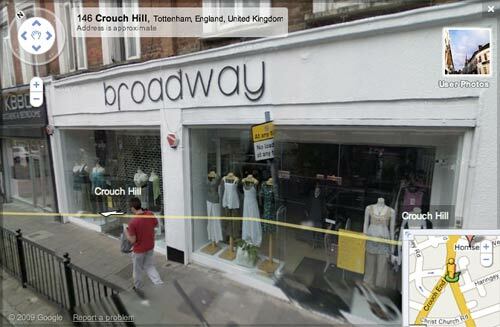 Yesterday I posted some comparison photos between Muswell Hill now, and Muswell Hill when the Google Street View cars visited, to illustrate how the "Credit Crunch" had been affecting local businesses. 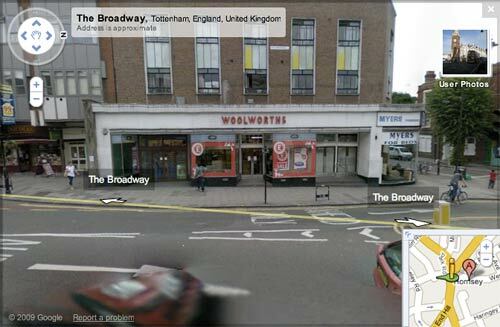 Actually, there only appeared to be three casualties - The Fine Burger Co., A-1 Wines, and Woolworths. In Crouch End, it was a different story. The biggest closure again appears to be Woolworths, which occupied a big store near the Henry Reader Williams memorial Clock Tower. 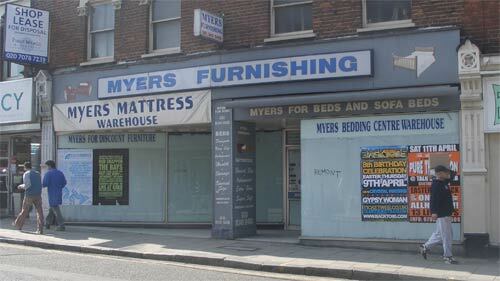 You'll also spot on the end of that block one of the Myers Furnishing showrooms. 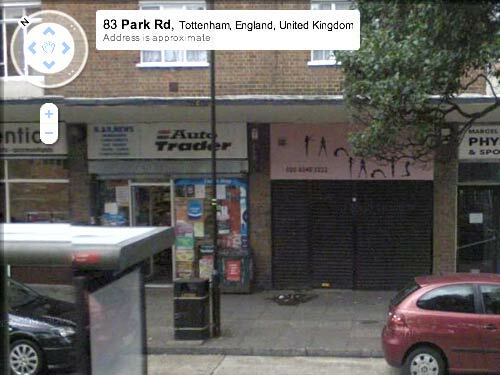 As well as this corner shop, the company occupied another large property in the area which is now closed. Some units have been closed for a while though. Both this corner bar and the 'Word Play' shop were already shut when Google came calling. In some cases it is hard to tell. 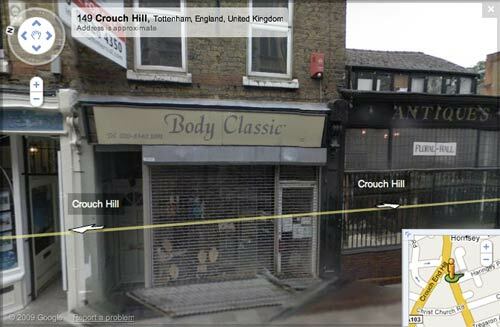 Google took pictures around Crouch End in the early evening, and so a shop like Body Classic looks like it might just be shuttered for the night. However, it appears exactly the same these days in the middle of the day. It was difficult to know whether it went out of business judging from these pictures - but the comments left here suggest it hasn't. Some shops have simply down-sized in the last few months. 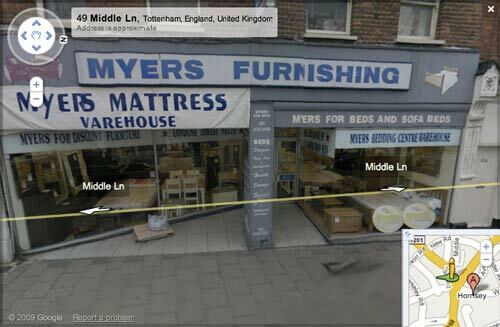 I did also take some other pictures of closed shop units around here, but it seems to be one of those bits of London that Street View has not completely covered on the first release. My favourite example though must be at Veryan Court. It is obviously compulsory to have some sort of pun in your name in this row of shops. 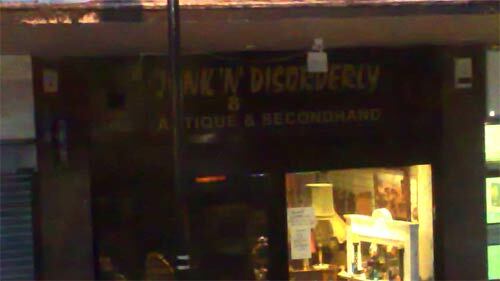 Google Street View reveals how underwear shop "Fancy Pants" has closed, but a second-hand goods store called "Junk'n'Disorderly" has opened. By Martin Belam on 12 April 2009. I've seen people going in and out of Body Classic, so I think it might still be doing business of some sort. Though rather confusingly the sign on it says "open" even when it is clearly not. Possibly, there was another shop that I had in this list until at the last moment I spotted it open. Although I'm really unsure what sort of opening hours don't include when I go past it on my commute to or from work, plus Friday lunchtimes. I see your point with this but pictures can be misleading and you've got a lot of this wrong. 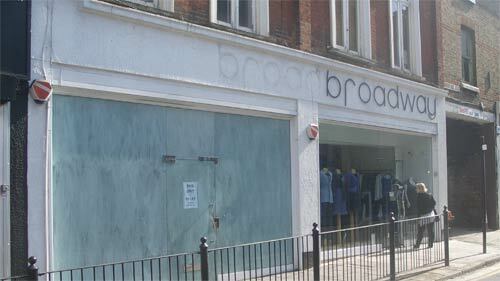 Crouch End has always had a high turnover of shops - long before the credit crunch. You've snapped 2 moments in time but not the full picture. 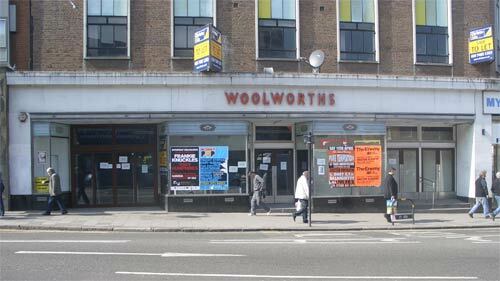 Crouch End Woolies was always packed and probs was own of their few stores that was profitable. 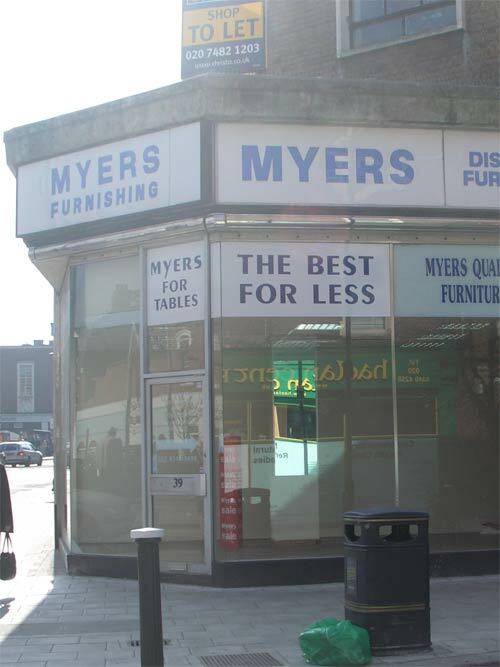 Myers - the smaller unit next to the old woolworths has just reopened just a few weeks after it shut as a book shop, the larger one is also in redevelopment already. The Broadway only expanded into the next unit last year and has now just returned to it's original size (as it had been for many years prior to the crunch). The unit on the corner of Weston Park (the light blue one) has been empty for at least 4-5 years during ie through 'good' and 'bad' times. Wordplay... from memory the owners retired after 20 odd years (I think). 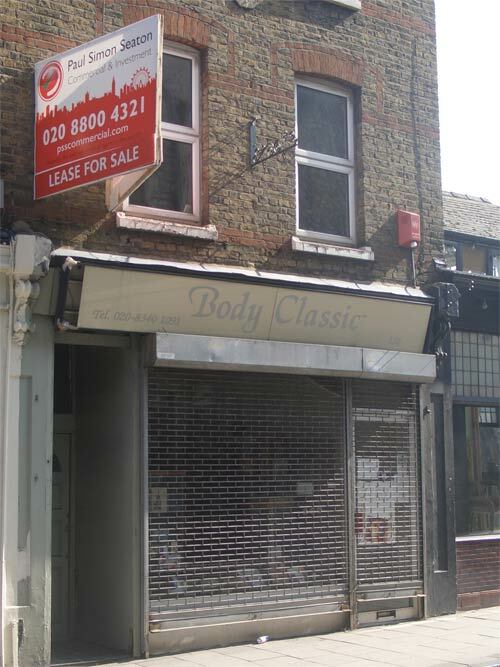 Body classic is definitely still open, fairly sure that bookies is too and can't remember what used to be in the other unit on Crouch End Hill but fairly sure it was something that it was hard to believe there was a much of a market for nowadays... natural evolution. There is a lot of change in Crouch End, but it's a bit naive to put it all down to the credit crunch as it's been like this for years and is always likely when you have such a high proportion of independent retailers. You also fail to mention that every other unit is some form of eatery, of which most seem to be doing very well despite crunch trends of people not eating out anymore. I find you so effective in expressing your views of the present economy. The pictures really speaks for itself, in short, self-explanatory. but I can't say more but "sigh" for the unemployed due to these shops closure. I've recently been editing this Crouch End virtual tour site and noting just the same thing - most of the virtual tours are from 2005 (2009 versions will appear soon) and seeing the difference in the shops is quite something. Komodo in Park Road has closed down recently. Mind you, the Creamery has been closed since before 2005!